Fathers and sons do all sorts of wonderful things together: the Griffeys played big league baseball, The Sheens stared in Wall Street, and Brian Wilson and his boy Carnie clearly enjoy many a meal with each other. 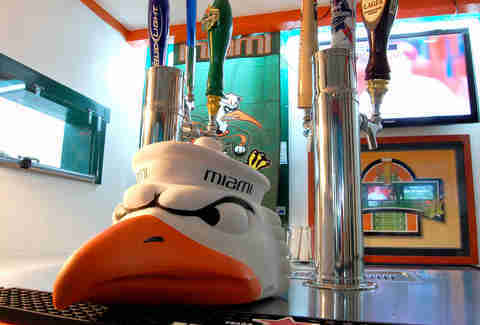 For a pops/son team producing an awesome 'Canes bar, hit Harrison's Sports Grill. 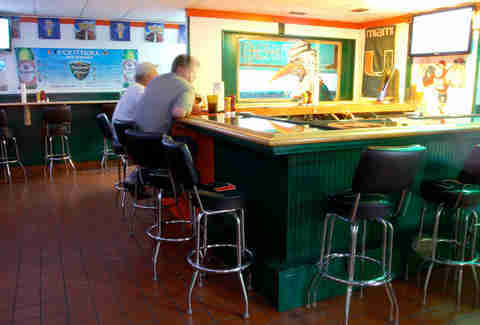 Set up in what was once the Blue Grotto, Harrison's is run by a local UM-obsessed father/son duo, and is now a 'Canes bar through-and-through, with a green & orange exterior paint job, and inside, 11 high-defs, "U"-symbol'd bar stools, and a big, hand-painted mural of Sebastian the Ibis looking pretty upset, clearly because he's thinking about Jacory's four picks last week. 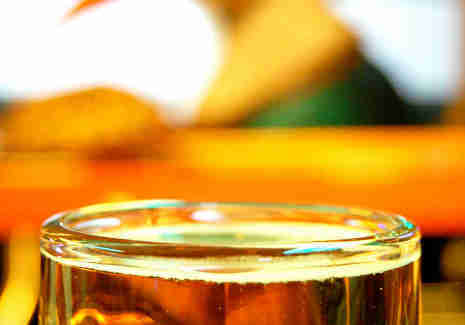 While football and drankin' are the main draw, handcrafted, step-up bar grub includes apps like smoked fish dip; loaded nachos with jalapenos, chili, cheese, and salsa; and mozz sticks that're hand-cut from a big block of cheese before being battered -- although they won't press charges, because mozz is noted for it's low sodium self-esteem. 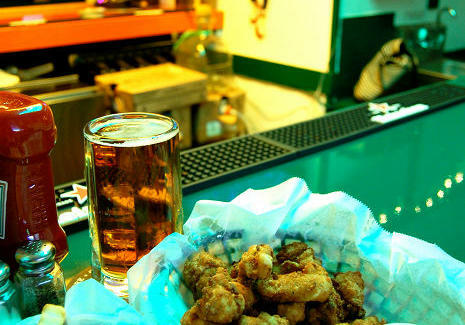 Bigger meals include wings that're flash fried, then grilled and done up with sauces ranging from mild to "Dante's Inferno"; hand-pattied 1/2-pound burgers topped with 'shrooms, bacon, jalapenos, or chili; and Florida-caught goods like peel-n-eat shrimp, mahi (blackened, fried, or grilled), and a basket of gator tail, also the only thing that makes the Swamp tolerable. The bar's got kegs right behind the taps to ensure the lines stay chilly/not-gross, including Yuengling, Presidente, and some old friends. Also, every Wed at 6pm the dining room will host a taping of the "'Canes-4-Life" TV show with Leon Searcy, followed at 8pm by karaoke, also what Brian and Carnie call the ultimate father-son bonding experience, as long as someone orders nachos.